A champion of cancer research and better patient care, Runcie Chidebe has demonstrated to his native Nigeria the importance of volunteerism and collective action for causes that benefit society. Through his nonprofit, Project PINK BLUE - Health and Psychological Trust Centre, he’s changing the narrative about cancer in Nigeria and engaging government, nonprofit, and private sector partners to work toward greater support for cancer patients. Since returning from his 2016 inspiring “Youth and Civic Participation” International Visitor Leadership Program (IVLP) exchange, Runcie has explored leadership strategies that facilitate social empowerment and justice, particularly for underserved communities. He has engaged more than 300 volunteers in series of cancer awareness programs, founded a cancer patient support hotline, and organized large-scale events in Africa’s largest city, Lagos, and Nigeria’s capital, Abuja. At a May 2016 Democracy Day event co-hosted by U.S. Embassy Abuja, he presented a paper entitled “Civic participation: stimulating empathy in Nigerian youths,” in which he encouraged youth to become civic leaders and build connections in their community through citizen engagement. In January 2017, he and Abuja alumni partners organized an impressive program with 300 secondary students to celebrate the life and values of Martin Luther King, Jr. The program included student speeches, mentoring discussions by U.S. exchange program alumni, participation by U.S. Embassy staff, and a screening of the film Selma. As an active member of the Abuja Alumni Chapter, Runcie frequently uses his connections with the U.S. Embassy to organize events at U.S. Mission Nigeria’s network of 11 American corners. He seizes every opportunity to educate, inspire, and empower Nigerian youth. Project PINK BLUE’s toll-free telephone center, certified by the Nigerian Federal Ministry of Health, is the only one of its kind in Nigeria, providing resources and a listening ear for those affected by cancer. Additionally, Runcie has provided free cancer screenings to hundreds of people in rural communities through community medical missions and generated awareness through community walks and events. It’s not uncommon to find Runcie leading crowd sourcing campaigns to raise money for low-income cancer patients or drawing Nigerian music and film celebrities to his cause to achieve greater publicity. Runcie’s success stems from his ability to mobilize a diverse network of partners toward a cause that transcends international boundaries. Through connections he made during his IVLP program, he has harnessed the support of some of the most notable names in cancer research and treatment. In November 2016, Project PINK BLUE coordinated the visit of Fulbright Specialist Laurie Tauriainen, a professional patient navigator with the Sarah Canon Research Institute in Dallas, Texas. Runcie introduced Ms. Tauriainen to a variety of communities and groups to familiarize her with the state of cancer care in Nigeria and opportunities for improvement. She trained 42 Nigerian nurses on patient navigation as part of a larger Breast Cancer Navigation and Palliative Program funded by partners including the Union for International Cancer Control and Pfizer Oncology. 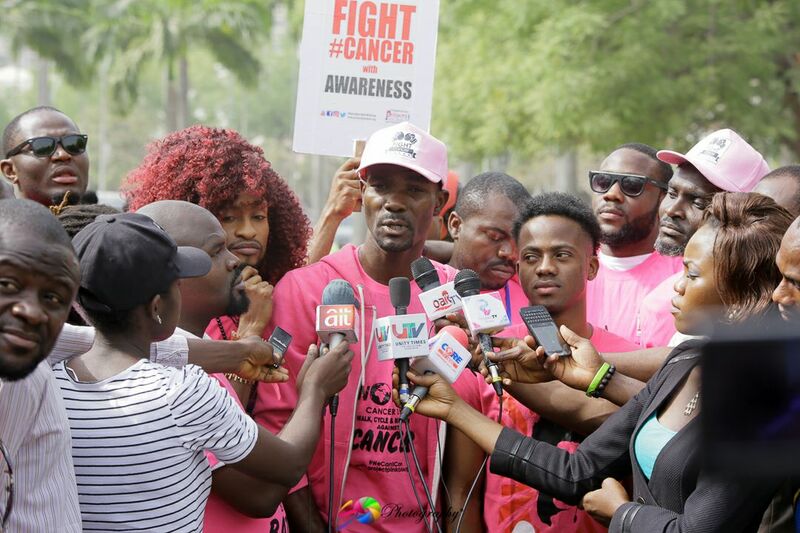 Project PINK BLUE has also partnered with the Susan G. Komen organization, whose headquarters Runcie visited during his IVLP, to translate the organization’s self-awareness materials into four Nigerian languages. He also visited the University of Texas MD Anderson Cancer Center, where he established additional contacts in the palliative care unit. His current project with the center includes monthly online palliative care training for nurses known as “ECHO Palliative Care in Africa” sessions. Runcie’s focus, commitment to achieving results, and ability to create positive networks for change distinguishes him among his exchange alumni peers. He was recently featured in The Guardian for his extraordinary advocacy work. His unceasing energy, good humor, and ease with which he works with others make him a natural leader for grassroots initiatives.